OXFORD, England (CNS) — German church leaders have criticized an anti-Islamic movement that staged mass demonstrations in Dresden and other cities, but they also urged a better understanding of public fears. “This movement looks set to grow — and the Catholic Church totally distances itself from it,” said Michael Baudisch, spokesman for the Dresden Diocese. Jan. 12 rallies by “Patriotic Europeans Against Islamicization of the West,” known by its German acronym as Pegida, were attended by 25,000 people in Dresden and thousands more in other cities. However, rival marches across the country the same day also drew tens of thousands in various cities. Baudisch told Catholic News Service Jan. 14 that Muslims made up only 2 percent of the population of Dresden and surrounding state of Saxony, compared to a much larger Muslim presence in Berlin, Mannheim and other regions. Pegida has organized numerous rallies since its formation in October with a 19-point manifesto calling for protection of Germany’s Judeo-Christian culture. Among Catholic church reactions, the lights of Cologne’s historic cathedral were switched off in protest Jan. 5-6, after the city’s archbishop, Cardinal Rainer Woelki, joined 80 other top personalities in a media statement against Pegida. “Christian values include compassion, generosity and willingness to help — not inflaming prejudices and stoking fears,” Bishop Feige told Germany’s Catholic news agency, KNA. “However, the church must seek a dialogue with the protesters if possible. This will be more helpful than just ruggedly distancing ourselves from them,” he said. 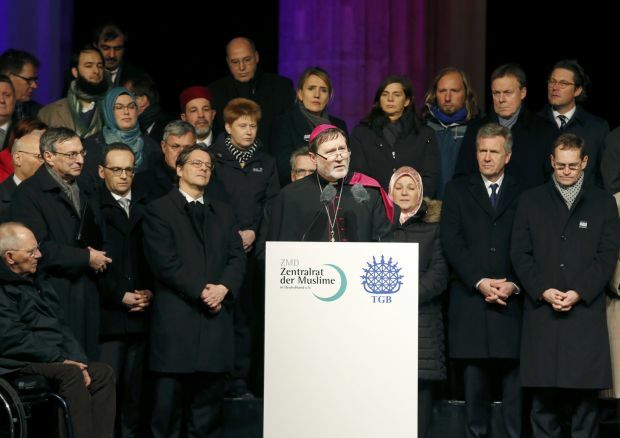 Auxiliary Bishop Matthias Heinrich of Berlin represented the German bishops at a Muslim-organized solidarity rally Jan. 13 at the city’s Brandenburg Gate. I presume it is progress in calling for protection of Germany’s Judeo-Christian culture since Jews were not exactly protected in the twentieth century. Now if only the manifesto called for adding Muslims to Jews in the protected category. Scapegoaters could always take out their frustrations with that evildoer in the bathroom mirror when awakening to a new day.